I first moved to the Conejo Valley in 1993. Back then there were nowhere near the number of restaurants we have in the area today, but there were some good ones. One of them was Bandits' BBQ in Thousand Oaks. In its original location in a small boxy restaurant behind the El Pollo Loco on Moorpark Road, I remember standing in line to order BBQ and usually taking a big bag of delicious BBQ to go. Occasionally I would eat in the small restaurant, grabbing a ice cold mug of beer to go with the food. Bandits was a local hole in the wall "secret" back then. Today, Bandits is located in a nearly brand new HUGE stand-alone, beautiful restaurant/bar adjacent to the old location and the Janss Marketplace Car Wash and the food is better than ever. Bandits has a fun, Western feel to it. Everything I've ever eaten at Bandits is delicious, including ribs, tri-tip, BBQ pulled pork sandwich, burgers, sandwiches. Everything. But I do like to eat "healthy" so I often order the Barbecue Chopped Salad or the Tri-Tip Salad. Be prepared to eat half the salad and take the rest home, as portions are huge. 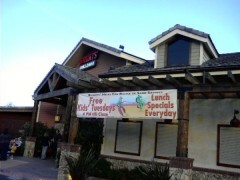 Recently I dined at Bandits Thousand Oaks with my 7 year old. I value his opinion on restaurants, but actions speak louder than words. The way he downed his BBQ pulled pork sandwich and corn on the cob, followed up by his Build-Your-Own-Sundae, it was quite obvious he LOVED the food. He also thoroughly enjoyed the entertaining kids' menu games and puzzles. As I kicked back with my kid, cold beer and delicious food, I observed many, many families enjoying the woodsy, busy, buzzing atmosphere of Bandits. As of March 2010, all the kids meals on the "Young'un Menu" for kids 10 and under were $4.99, including beverage. Meals include tri-tip sandwich, tri-tip plate, cheeseburger, mini corn dog, chicken strips, BBQ pulled pork sandwich, grilled cheese or baby back ribs (these were $6.99 for 4 ribs), plus choice of side. The sundae was only $1.79. I'm also a fan of the Camarillo Bandits in Old Town Camarillo. Quality of the food here is consistent with Thousand Oaks. This location is not quite as large as Thousand Oaks but big enough, also with a Western feel, with a hitching post saloon! What I like at this location is the huge barrel of peanuts that you scoop up, place on your table, then throw the shells on the ground (at least that's what I do...it's cool...its part of the atmosphere). Problem is, sometimes I eat so many peanuts I have little room left for my meal! More recently Bandits has expanded their menu with more healthful choices, including more salads and fish dishes. I recently (December 2011) tried the red trout lunch (see pic) and thoroughly enjoyed it. So if you aren't a big red meat eater, there's plenty of alternatives available. Bandits locations are at 589 N. Moorpark Road, Thousand Oaks (805.497.7427) and 1980 Ventura Boulevard, Camarillo (805.445.4742). Visit www.banditsbbq.com for more information.